Trakk Shell is today's bag for all digital purpose and day to day needs. Its waterproof, lightweight and has built-in Bluetooth for smart connectivity. It is so tough that you can even go for hiking with it. It has smart multifunction features which excite everyone around. Trakk Shell backpack is specially designed to be very lightweight, has Max-bass speakers, is a Waterproof, Shockproof, Dustproof, Stain resistant, has built-in LED and Controller and everything you might need while you are on your business trip or a super cool adventures journey. Some of its cool features also include a built-in mic so that you can take calls directly while on the go. It has an Aux port which can be used to hook your devices to it. It comes with enough 5200 mAh power bank so that you can get extra juice for your devices anywhere. It also has a Tf/memory card port so that you can play your favorite music from memory cards. 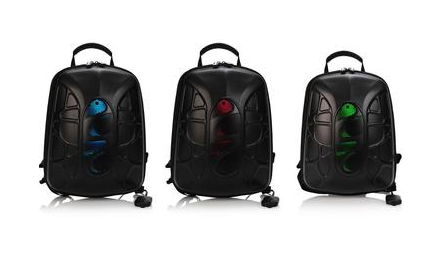 The smart backpack can fully run with music speakers on for up to 12 hours and can be connected to Bluetooth from almost up to 65 ft distance. And yes, a smart controller to work on most of the features quickly with a single click. Let us know your first impressions about this super backpack.